It’s not that I have not hosted successful parties, but there always seems to be that one thing missing and certainly dishes are always in the sink. 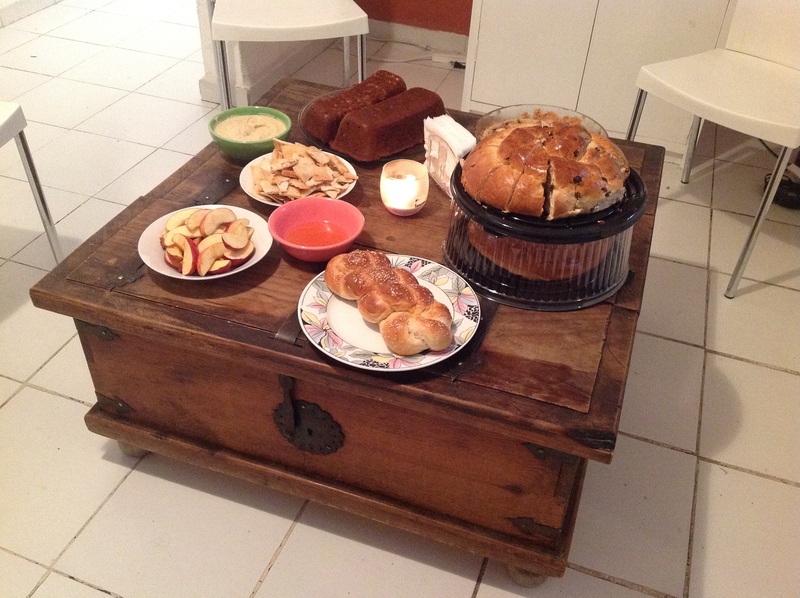 Last night seventeen people came over for my annual Rosh Hashanah dinner. This year it was special for many reasons. First, everything was ready half-hour before the guests arrived! 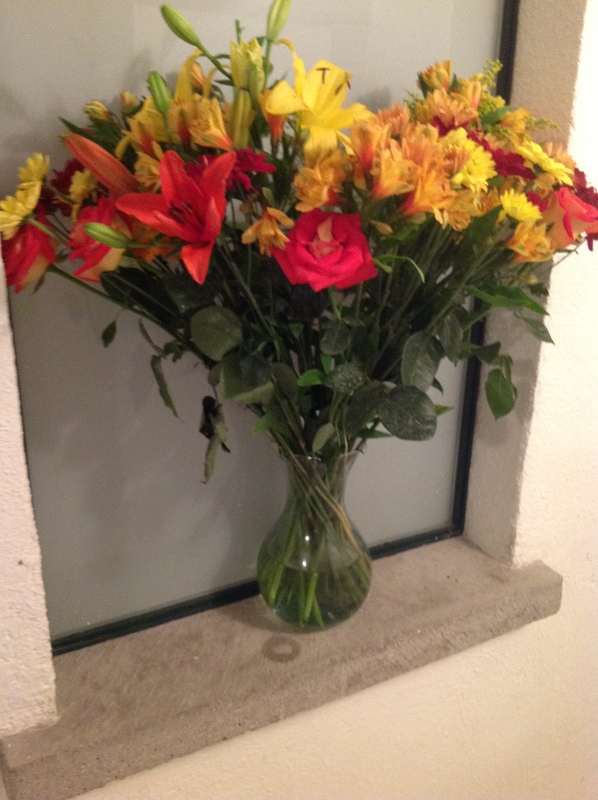 Dishes were put away, counters were wiped clean..I even had time to buy flowers from the market before hand. The market this time of year is beautiful! That’s another reason that I love this holiday. Even though I do not live in a place (nor have I for several years) where I experience the leaves changing the market here reflects the changing of the seasons. When I walked in on Saturday to buy produce humungo pumpkin and squash lay on every puesto’s table and shelf. The colors at this time of year are unbelievable. I had asked guests to bring indoor shoes (something new!) After scrubbing and scrubbing my white floor and still specks of black held on I thought that maybe I would give my invitees the choice. It was clear, however, that as they arrived, soaked from the pouring rain, the choice of slippers and socks was a good one. It was so cute the way they would each take off their rainy wet shoes and ceremoniously, almost, slip into their comfy feet, and enter into the warmth of sweet company and food. The other marked difference this year is that I would be the only Jewish person. This meant much fretting over the menu. “What if people don’t eat?” I asked my parents over the weekend. “I mean pickled salmon is not exactly an every day menu item in the U.S. or Mexico…unless you live in Brighton Beach in Brooklyn!” I was really worried about the noodle kugel. I had taken a classic recipe and substituted the milk, cream, and eggs for tofu. What if they didn’t like it and then the next time someone offered them the real noodle kugel they would turn up their nose? The kugel was gone by the end of the evening (I knew I should’ve made two!..oy), and the salmon was devoured (thanks, grandma!). Every year I give a little schpeel about the meaning of Rosh Hashanah and my interpretation of it. I had decided earlier in the day that I would give my little talk in Spanish. Amazingly, everyone who attended last night was bilingual (which is just so much fun). And, I’m really glad I did. Just the gesture of attempting (and…succeeding) of expressing my agradecimiento (gratefulness) meant a lot to those whose first language is Spanish. The best part, of course, was the company. It was so wonderful to run downstairs, greet a person at the front door, and hear English and Spanish floating from the top window, feeling pride that it was my window. and I wish you a much deserved Happy New Year and Chag Samaya (a year filled with sweetness and prosperity). 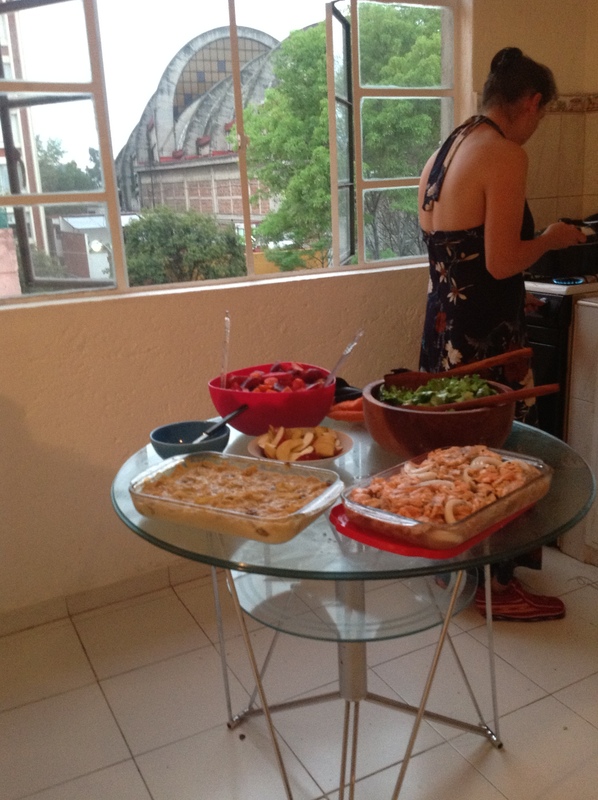 This entry was posted in Mexico, travel and tagged cooking, dinner party, Jewish holiday, travel. Bookmark the permalink. Pues, que puedo decir? Casi llorando, muchas gracias. Cualquier minuto uno cliente va a llegar. Te quiero muchisimo! Salud y besos y abrazos para tus amigos! Choy Smayo. Tal vez, el ano que venga en Mexico o en Petaluma o en los dos! lugares! Por que no! Sarah-la! Today was the SF Theater Festival – and here you were, miles away, recreating one of your favorite performances – adulthood! Here’s to fresh sponges and matching towels and cozy (no-marking) footwear. AND – extra points are awarded to 30 minutes of pre-party calm. 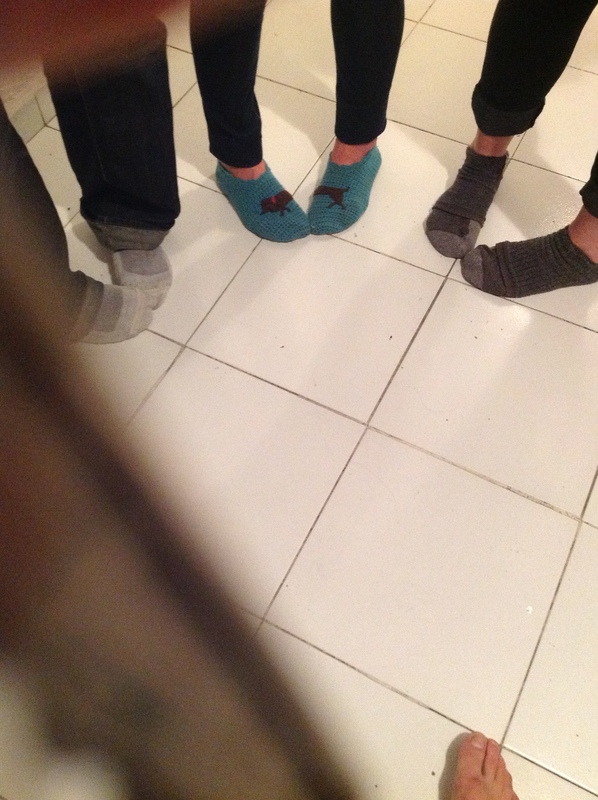 Nice shoes and sock photo- are you a fetishist?